When you believed God and confessed Jesus is Lord, you received the spiritual gift of the new birth. 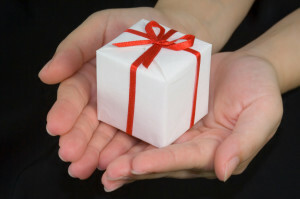 Wrapped up in that gift are spiritual abilities, often called gifts, most of which are given to empower you so that you can use to serve others. Romans 8 talks about using the gifts you were given to serve others. Romans 12:4- 8 NIV, “4 Just as each of us has one body with many members, and these members do not all have the same function, 5 so in Christ we who are many form one body, and each member belongs to all the others. 6 We have different gifts, according to the grace given us. If a man’s gift is prophesying, let him use it in proportion to his faith. 7 If it is serving, let him serve; if it is teaching, let him teach; 8 if it is encouraging, let him encourage; if it is contributing to the needs of others, let him give generously; if it is leadership, let him govern diligently; if it is showing mercy, let him do it cheerfully. The gifts God is talking about are spiritual and came with the ‘package’ of the new birth. But you have talents and abilities you’ve already developed, and God wants you to use those as well. The spiritual gifts He gives you enable you to serve in those ways with a spiritual advantage. We will discuss spiritual gifts in a future article, but for now I wanted to discuss just serving whatever it is you are prepared to serve right now. In this excellent article (Copyright 2014 Theresa Johnson), we learn three ways to identify how you can serve others. Are you longing to do something for God but feel like you are all out of ideas? Many believers find themselves in this place. But the truth of the matter is this: Every person has something of value they can offer others. God is not waiting around for us to pick out that very unique thing or even waiting for us to produce the BIG thing. Rather, we must simply learn to use the gifts within us. Make a list of things you are naturally good at doing that provide a service to others. For example, you may be good at organizing, cooking, tutoring, carpentry, yard work or even taking pictures. Identify community organizations or individuals that would greatly benefit from your gift or talent. This could include using your gift for a one-time initiative or making a commitment that extends over a period of time. You could share your gift among those you know well – family, friends or coworkers; or branch out to strangers in need within community organizations or your own neighborhood. Contact one of those organizations or individuals, tell them about the service you are offering as a blessing to them, and then schedule a time to serve. Then, simply follow through on that commitment and be blessing to that organization or individual. It really could be this simple. Setting aside opportunities to do something for God are as simple or as complicated as we make them. Sometimes, we need to be reminded that we have numerous gifts and talents on the inside of us that God is reading and waiting to use. The most important thing to remember is this: Whatever you decide, do everything as if you are doing it joyfully on behalf of God.” After all, our service to others is an extension of his love and grace. By doing what you are already good at doing, God can work within you to will and to do of His good pleasure. Make yourself available. Serve in whatever way you are able, and God will empower you. If you need an outlet to serve, we are looking for volunteers at the Christian Culture Center. Visit the Christian Culture Center’s Involvement Partners Page today and volunteer!